Forming in 1990 as a doom metal band, ANATHEMA has gone through a couple of transformations in their music style and several lineup changes since then. After releasing two early albums in the doom style, ANATHEMA saw the departure of singer Darren White. This marked the beginning of a change to more of an alternative metal format with guitarist Vincent Cavanagh taking over the role of vocalist and shifting to cleaner vocals. 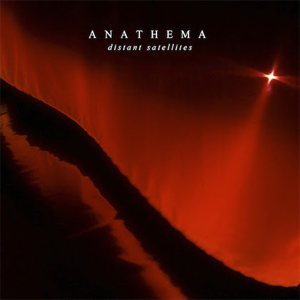 Five full length albums later and we find ANATHEMA taking on another change in their music style to progressive rock. Atmospheric would be a good word to describe the sound. After bringing on Lee Douglas as full time co-lead vocalist back in 2010, who had performed as guest vocalist on a few previous releases, it solidified ANATHEMA’s place in their genre of music. It probably helps that the drummer, John Douglas, is your brother. Lee’s haunting voice is nothing short of angelic and leaves goose bumps all over when she hits those soaring highs. Ten albums later bring us to their latest release, Distant Satellites. This particular album features more electronica sound than their previous releases. Opening up are two tracks that are tied together, “The Lost Song Part 1” and “The Lost Song Part 2”. Part 1 finds Vincent singing all the primary vocals and Lee singing backup with smooth blending harmonies throughout that picks up tempo at the end. This leads into Part 2, with Lee taking on the lead role on vocals. This song is the most beautiful song on the album to go with Lee’s amazing voice and is a great follow up to Part 1. Pairing their vocals together again on the song “Dusk (Dark Is Descending)”, we find another slow starting song that turns powerful as it rolls on with a good Roger Waters-type fadeout in the middle. “Ariel” is another beautifully composed song with Lee and Vincent trading off on vocals while blending into a dramatic climax at the end. The song “Anathema” is a solid track that is probably the heaviest (I use that term loosely) song one will find on this album. Starts of slow and takes half the track to get there, but has a great solo that relaxes into a soft piano finish. The next two tracks, i<>“You’re Not Alone” and “Firelight” are more instrumental than songs with the latter being what sounds like organ music. The last two tracks to finish off this latest offering from ANATHEMA feature more electronica and feel a little like R.E.M. songs. They could’ve finished the album with better songs, but that’s just my opinion. For a band that started out as a death, doom metal band, ANATHEMA has come a long ways since the dark and foreboding days of their first two releases. Ever evolving and bringing harmony and balance to set the mood for a musical journey only they could deliver. They are a great band to see live but are best live when they are playing with a full orchestra. They are already starting to tour in Europe and hopefully prospects are good for a full North American tour later this winter. Overall a solid release from ANATHEMA.